Those travelling past the San Francisco LGBT Community Center last Wednesday evening may have caught a glimpse of signs denouncing infant circumcision and challenging the claim that male circumcision protects men from HIV. 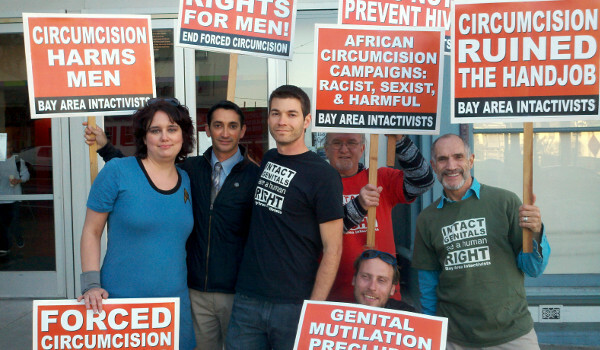 Bay Area Intactivists, a human rights group opposed to forced genital cutting, organized the demonstration which took place prior to a panel discussion on global issues pertaining to HIV/AIDS and the human rights of gay men. 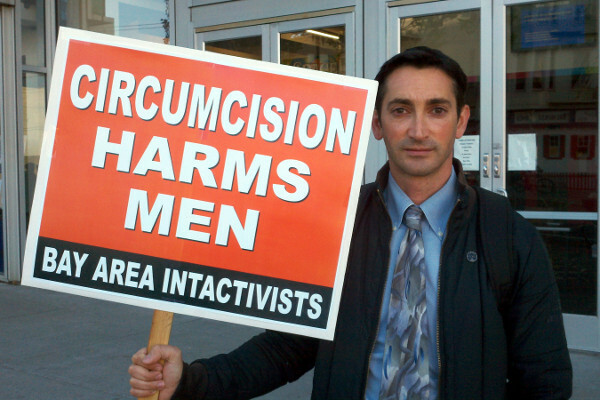 For two hours, the intactivists carried signs, passed out literature, and spoke with members of the community about how infant circumcision diminishes men's capacity for sexual pleasure and denies men of their human right to bodily integrity. The demonstration was warmly received by the organizers of the panel discussion who later invited the demonstrators inside to attend their event.